Almost as traditional as horror can be, The Twilight Pariah follows through with the story one would expect after such an intro—shadowy demons, an unsettling mansion history, and a real and present danger that wants to kill. It has great pace—not frenetic, but just the type of rhythm that complements the type of story being told. To be fair, Ford does pull his punches in a few scenes where letting loose might have been the better option—a greater sense of urgency or fear the result. But overall, he sticks the formula. 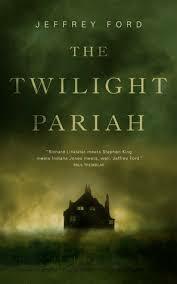 In the end, The Twilight Pariah is a classic horror story set in contemporary times. The three main characters communicate with cell phones and use facebook (and smoke the occasional joint), but the heart of their plight still lies in the unearthing of strange, dark beings of centuries past and the terror they bring. Essences of Poe and Lovecraft lingering, fans of those writers will undoubtedly find something to love in Ford’s novella. Diehard fans of Ford’s work, however, may find the offering simple fare compared to the majority of his other fiction. *If you can, avoid reading the backcover blurb. It gives away almost three-quarters of the plot, and with such stories, major plot reveals are about the only thing to hang your hat on.